Making History in the D.
It didn’t take much to convince Jon Haber, a spry “over 65-year-old” bike enthusiast who lives in Huntington Woods, to sign up for J-Cycle, the upcoming bike tour of historic Jewish Detroit. In fact, it didn’t take any convincing for this fan of the event to sign up. Once he got the notice that registration was open, he logged on and signed on. Last year, on a sunny August morning, Haber was among the first to arrive at the inaugural J-Cycle event. Active with several Jewish organizations throughout the community, and a fan of anything having to do with preserving and sharing our history, Haber loaded his bike on a SEMTA bus and took the ride downtown, joining nearly 150 other cyclists who chose to make history in Detroit that day as they participated in this bike tour of the city. 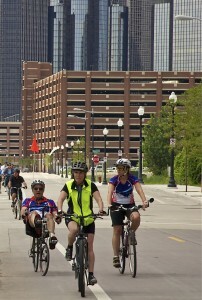 This year, on Sunday, August 19, the Jewish Historical Society of Michigan, Isaac Agree Downtown Synagogue, Reconstructionist Congregation of Detroit and Hillel of Metro Detroit will again make history as they present J-Cycle II, a 20-mile bicycle tour of Detroit. Designed to celebrate the many developments in and around Detroit and explore the city’s rich Jewish history in an up-close and personal way, the tour includes 10 stops where docents narrate the contributions of Detroit’s Jewish leaders, past and present, who have enriched our culture and history. Many of the stops included in this year’s tour celebrate the “return” of young Jewish adults to Detroit, where many reside and work. 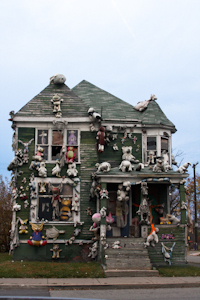 Riders will explore such locations as the Heidelberg Project, the Detroit Eastern Market, Corktown’s Spaulding Court and Detroit Farm and Garden. Before riders depart, all will gather for a celebratory Kosher breakfast in the Park – Milliken State Park, along the Detroit Riverfront – the site of an historic marker depicting the service of Jews in the Civil War and the landing of the first Jewish Detroiter, fur trader Chapman Abraham. Although all four of the presenting organizations are non–profit institutions, the mission of J-Cycle is to be a community education celebration rather than a fundraiser. The first stop on the tour, for example, is the Beth El section of Elmwood Historic Cemetery located on Elmwood Street near Mt. Elliot on Detroit’s east side. While seeing this Jewish section, docents will discuss the German Jews who arrived in mid-1800s and created Detroit’s first congregation, Congregation Beth El, in 1850 and its cemetery in 1851. The Elmwood Cemetery is also the burial place of former Mayor of Detroit Coleman A. Young. J-Cycle – sponsored by M. Jacob and Sons, Culligan Water, Pegasus Entertainment, Weight Watchers, Inc., and Wheelhouse Detroit – also gives back to the city. A portion of each entry fee is being donated to The Hub of Detroit’s Back Alley Bike Project. The Hub is a non-profit bicycle reuse and repair shop located in Detroit’s Cass Corridor which helps to create a fun, safe environment for Detroit’s youth – and adults – to learn cycling. Rose Bice expects that this year’s J-Cycle will sell out as it did in 2011. There is a limit of 250 riders, who will depart in groups of 50. Each group will have a team leader who knows the route, and at each stop docents will narrate the history. Fast or slow, experienced or novice, all riders from ages 16 to 80 are welcome to participate. So, whether you’re looking to meet more people in the local Jewish community or engage in the history of Detroit, join the gang on August 19…but you must register first. The registration fee is $30 for adults and $25 for students age 25 and under. To register, go to www.michjewishhistory.org, or call the Jewish Historical Society of Michigan at 248-432-5517. 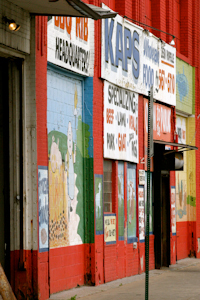 The Detroit Eastern Market spans 43 acres. With 250 wholesalers and retailers, shops and galleries, it’s the oldest and largest market of its kind in the U.S.
Comerica Park and Ford Field are built over what was once a Jewish neighborhood where there was at least one former shul (located on Montcalm Street). Got a fun fact to add about Jewish Detroit?